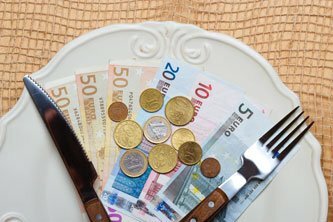 How should I calculate my food budget in Canada ? * Prices include taxes and tip. The sample budgets above are based on all meals being eaten in restaurants. Naturally, you can make substantial savings if you buy a few meals at the grocery store or local market. That way, you can enjoy a quiet breakfast in your hotel room or a charming picnic lunch or dinner in a scenic location.